INDIA AWAKENS CONFERENCE UPDATE: The full Conference will be postponed by one year, to Sunday, February 11, 2018. A “mixed” virtual/physical Conference, free of charge, will be held as scheduled on February 12, 2017. It appears that we won’t be able to raise enough money to bring the speakers to Kolkata for the India Awakens Conference on February 12, 2017. Unfortunately, the fundraising campaign that we started hasn’t been successful so far, and it doesn’t seem likely that things will change in the immediate future. We still intend to raise enough money for a full Conference in Kolkata as planned, but we have to admit that holding the full Conference on the scheduled date of February 12, 2017, is unrealistic. 1. The full Conference will be postponed by one year, to Sunday, February 11, 2018. Besides the change of date, we intend to keep everything as outlined in the Conference web page, with the possible addition of some speakers. The full income of the fundraiser, minus some minor expenses for point 3 below, will be used for the full Conference in 2018. 2. We will continue the online interviews program in which five speakers have participated so far: Frank Tipler, Ralph Abraham and Sisir Roy, Amit Goswami, Robert Geraci. 3. A “mixed” virtual/physical Conference, free of charge, will be held as scheduled on February 12, 2017. The local audience, admitted free of charge upon prior request on a first-come first-served basis, will be at the Ramakrishna Mission Institute of Culture (RMIC), but the speakers (except, of course, those in Kolkata) will give their talks and answers online over the Internet. Some speakers will talk in real-time and take questions, others will provide pre-recorded talks. The “mixed” virtual/physical Conference will feature a two-way real-time link between the RMIC conference hall and the Terf virtual environment used for the online interviews, with local participants at RMIC and remote participants in Terf. 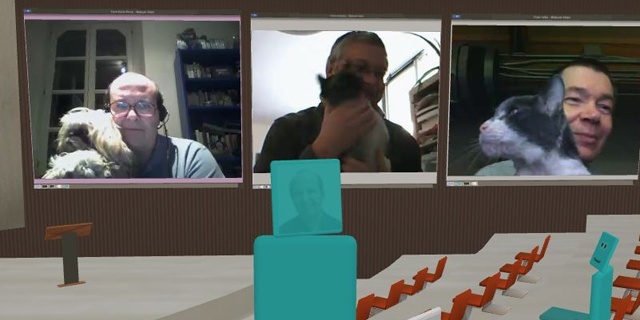 This method, which permits a two-way real-time interaction between the local and remote participants, was used in 2010 for two “mixed” virtual/physical conferences: ASIM 2010 Conference, Advancing Substrate-Independent Minds in San Francisco, and Transvision 2010 in Milan. Besides the remote speakers, we will invite remote participants to attend the Conference in Terf. The picture below shows the two-way interaction between local participants in San Francisco and remote participants in Terf. Just would like to recall that our dear Sacha was part of one of those online interview programs that Dr.Prisco hosted in which I was also part of. That historic chat (http://turingchurch.com/2016/08/24/akashic-physics-and-engineering-video-qa-with-ralph-abraham-and-sisir-roy/) is very very close to my heart for very many reasons Sacha ,one of them. Thanks Nupur. Yes, Sacha was mentioned and heard in that program, and participated more actively in previous programs. Here I am holding her in a picture of a few years ago taken in a preparation session for the Turing Church Online Workshop 1 (2010). The poor sweet little thing is 18 (!!!) and not doing too well, please pray and/or send some spiritual energy her way.